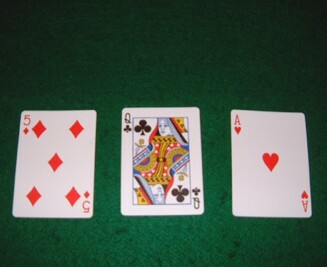 cards) you should stay with or fold before the flop (the first three communal cards). One reason people lose is simply because they play too many hands before the flop. money. Many hands should not be played. cautious playing lower pairs in late position, especially if there is a raise before you. holding Jack Jack, you will see at least one over card 50% of the time – on the flop! And this over card could be the one that beats you. pair, especially if there was a raise pre-flop. other player has AK and has you out-kicked, before you have even seen a pair. very good odds for your hand to hit. increases their potential by roughly 2%. flop perfectly, you hit partly or you miss completely. missed completely – you just fold. straight you are more likely to have the nuts with the straight. K. That gives him 12 outs instead of just 4.